Thairo Estrada signed out of Bejuma, Venezuela for the bargain price of $49,000 way back in November of 2012. He was relatively unheralded, as evidenced by both the price tag and how late he signed, and was something of an afterthought in a class in which the Yankees jumped all over three highly-rated prospects on day one of international free agency – Luis Torrens, Alex Palma, and Yancarlos Baez. 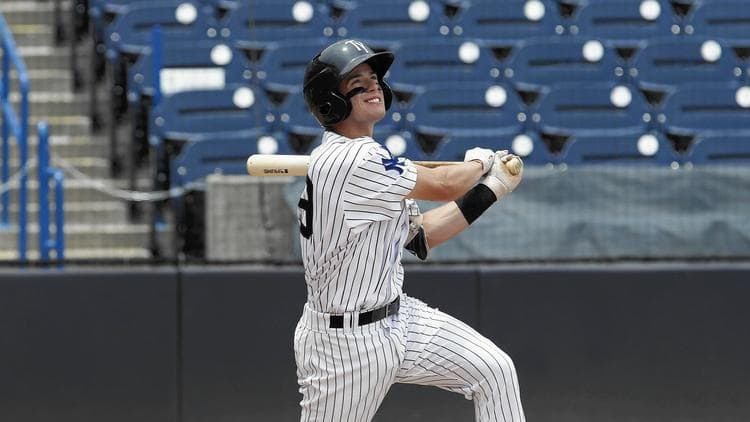 The Yankees has $2.9 MM to spend in 2012, thanks to the new spending rules, and $2.75 MM went to those three prospects; Corby McCoy garnered the last $150,000 in mid-August. 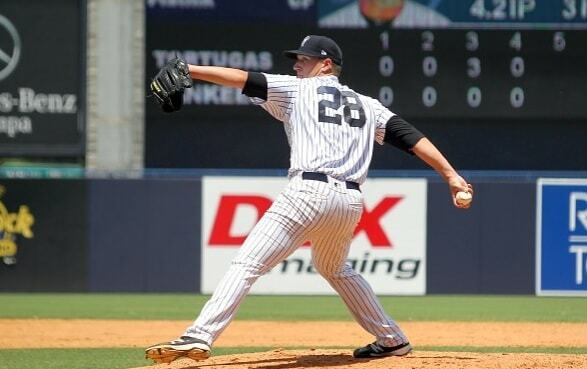 Estrada (and others) were signed much later, with the Yankees using one of their six $50,000 exemptions. It’s interesting to bring up these names as a means to reinforce just how much of a crapshoot the process is. Torrens was a Rule 5 selection by the Padres last winter, and spent all of 2017 riding their bench (and hitting .163/.243/.203). Palma has yet to move beyond High-A, which he just reached for the first time this year. Baez shifted from shortstop to the mound this year, after batting .211/.278/.296 in 639 minor league plate appearances. And McCoy was released this summer, having never advanced beyond the Dominican Summer League. And then there was Estrada. Estrada made his professional debut in 2013, when he spent the entire short season in the rookie-level Gulf Coast League. He batted .278/.350/.432 (132 wRC+) in 199 PA, and spent most of the season at shortstop (327.2 innings). He also dabbled at the keystone, starting nine games and logging 75 innings at the position. It wasn’t quite enough to put him on the radar – few summer league performances are, unless the prospect comes in with a significant amount of hype – but he did check-in at 20th on Baseball America‘s Top-20 GCL prospects list. There were five other Yankees on that list in Torrens, Miguel Andujar, Abiatal Avelino, Gosuke Katoh, and Luis Severino; quite the intriguing bunch. Unfortunately, 2014 was a lost season for Estrada. He opened the year with Staten Island in the New York-Penn League, and he hit an empty .271/.348/.288 (96 wRC+) in 17 games at that level. He suffered a leg injury running the bases on July 4, and was shut down for six weeks. Estrada did make it back in time for a six game tune-up stint in the GCL, giving him a total of 90 PA that year. And so it was back to Staten Island in 2015, and Estrada got right back on-track. He slashed .267/.338/.360 (108 wRC+) in 279 PA, with nearly as many walks (23) as strikeouts (30). He once again split his time between second and short, albeit with a heavy tilt towards the former this time around (45 games at second against 19 at short). This was not a knock on his defense, however; rather, it was a move made in deference to 2015 first-rounder Kyle Holder, who was drafted predominantly for his slick fielding. Estrada headed to Low-A Charleston in 2016, where he would join a middle infield logjam with Holder, Katoh, and Hoy Jun Park. He spent just 35 games at the level, logging 21 games at second, 9 at third (his first professional experience there), and 5 at short, all the while putting up a solid .286/.324/.429 (116 wRC+) slash line. It became clear at this point (if it wasn’t already) that the Yankees were grooming him for a utility role. He was promoted to High-A Tampa, and it was more of the same … in a good way. Estrada hit .292/.355/.375 (117 wRC+) in 351 PA at the level, with strong walk (8.3%) and strikeout (13.1%) rates. And he once again played all over, putting in 38 games at third, 36 at second, and 3 at short. This time, however, it was around a new crop of teammates, in Avelino, Jorge Mateo, and Gleyber Torres. As a result of his flexibility and solid offense, Estrada popped-up on more radars than ever last off-season, earning the sleeper designation from countless outlets. He didn’t disappoint in 2017, slashing .301/.353/.392 (107 wRC+) in a full season at Double-A Trenton. Estrada continued to showcase a high-contact approach, posting a tiny 10.3% strikeout rate in 542 PA. And he served as the team’s primary shortstop, playing 90 games there, while continuing to spend time at second (23 games) and third (3). He was named to the Eastern League All-Star team for his efforts. Estrada’s season continued into the late Fall, as he suited up for the Scottsdale Scorpions in the Arizona Fall League. He hit .342/.381/.430 in 79 at-bats while serving as the team’s shortstop, and he was named to both the AFL Rising Stars game and the AFL All-Prospect Team, to boot. Estrada is oftentimes described as the prototypical Venezuelan shortstop. He checks in at around 5’9″ and 180 pounds, and he has incredibly smooth actions on defense to go along with above-average range and enough arm for any position. His arm can be a bit erratic on longer throws, leading some to suggest that he is best-suited for second – but that aspect of his game has improved over time, and accuracy isn’t a problem on routine plays.
? The soon to be 22-year-old lacks a carrying tool on offense, with the possible exception of his hit tool. Estrada has a quick bat and he is capable of barreling balls anywhere in the zone, and he utilizes the whole field. He also has a good approach at the plate, posting solid walk rates while rarely striking out. However, he doesn’t drive the ball with much authority, and it’s easy to grade his power as below-average. He has just 18 home runs in 1609 professional plate appearances, for reference. Speed might be the most interesting aspect of Estrada’s game, as he draws above-average to plus grades for his raw speed, and praise for his base-running instincts when taking the extra base. However, he has been a largely ineffective base-stealer, with 49 steals in 77 attempts – a 63.6% success rate. It was worse than ever in 2017, when he was successful in just 8 of 19 steal attempts. And the shape of his overall profile may hinge on his ability to translate that speed into better results. If Estrada can continue to make a bunch of contact, draw walks, and play average defense at second, third, and short, he can be a valuable bench player. If he can do all of that and take advantage of his speed on the basepaths, he may well be a starting quality player. Estrada was added to the team’s 40-man roster this off-season, and he will almost certainly reach the majors in a limited capacity at some point this season. He’ll otherwise spend most of the year at Triple-A; where he plays in the field will depend on what happens with Andujar, Torres, and Tyler Wade, but it seems likely that he’ll continue to bounce from position to position. I’m a big believer in Estrada’s defense at short, and I have him comfortably within the Yankees top-ten prospects. With some refinement on the basepaths he could be a player that contributes in everything but power, and enough so that his lack of pop isn’t a drain on the lineup. He doesn’t quite have the feel of a player that the Yankees will trot out as a regular, given their depth in the middle infield and his lack of bat for third, but that doesn’t hinder his value in a vacuum. Freicer Perez was signed by the Yankees for the bargain basement price of $10,000 back in 2014. A native of Santiago de los Caballeros, Dominican Republic, the second-largest city in the country, Perez was a relative unknown in that year’s international free agent class, and was little more than a footnote in the Yankees spending spree that summer. He was also the veritable ‘old man’ of the group, as he was a few months beyond his 18th birthday when he signed. By the time the summer was over the Yankees had spent around $17 MM in bonuses, and another $12-plus MM in taxes. And Perez might just be the best of the bunch. Perez was 19 by the time he made his professional debut in 2015, checking in at right around the league-average age for pitchers in the rookie-level Dominican Summer League. He spent the entirety of the season there, tossing 69.2 IP of 3.23 ERA ball. Perez posted strong peripherals, as well, with a 22.7% strikeout rate, 5.7% walk rate, and 48.0% ground ball rate. Despite his strong effort, Perez remained entirely off of the radar at this point. That’s not terribly surprising, giving his low profile in a massive IFA class and his lack of jaw-dropping numbers, but relative anonymity is always something that I find interesting. Perez didn’t even appear in a Baseball America article until September of 2016. But I digress. The Yankees continued the slow and steady approach with Perez, as he spent all of 2016 at short-season Staten Island. He was far less successful against the better competition, posting a 4.47 ERA in 52.1 IP. It wasn’t just his run prevention numbers that slipped, either – he struck out fewer batters (20.6%), walked way more (10.5%), and essentially stopped garnering grounders (32.7%). It was a speed bump statistically, but he nevertheless started popping up on prospects lists – and the two may well be related. You see, Perez went from throwing in the low-90s in 2015 to bumping triple-digits in 2016, so his struggles may be attributed to attempting to harness his newfound stuff. And that’s just what he did in 2017, posting a 2.84 ERA in 123.2 IP at Low-A Charleston. He brought his strikeout rate back up to 22.7%, trimmed nearly two percentage points off of his walk rate (8.7%), and rediscovered the joys of keeping the ball on the ground (43.4% grounders). And, despite the perils of selective endpoints, it’s worth noting that he scuffled out of the gate (5.79 ERA in April), and then dominated the rest of the way (2.46 ERA, 24.1% K%, and 8.0% BB% in his final 109.2 IP). That’s enough to put him onto some prospect radars outside of the Yankees fandom, too. Perez is the exact sort of pitcher that the Yankees have sought out in recent years, checking in at 6’8″ and around 200 pounds, with the ability to throw the baseball incredibly hard. His fastball sits in the the mid-90s, routinely flirting with the 100 MPH threshold, and it has a nice bit of sink to it. The simple fact that he has that much velocity with that much movement gives him an edge over similarly hard-throwing prospects.
? The whole profile revolves around his fastball, as it is his go-to pitch in every situation. However, Perez does throw three other pitches – a mid to high-80s change-up, a mid-80s slider, and a low-80s curveball. His change-up is his second-best pitch, with great separation from his fastball and a good ability to repeat his arm speed. It doesn’t have much movement, though, and when he’s off his game it plays as a soft fastball. Perez’s slider and curveball are very much works in progress at this point, and he doesn’t use either pitch all that often; whether that’s a product of a lack of confidence in the two or the simple fact that he doesn’t need them to get minor league hitters out is an integral question in determining his ceiling. Mechanically, there’s some good and some bad for Perez. There’s some natural deception in his delivery, his arm speed is consistent, and the total package is fairly clean, with nothing that screams disaster-in-waiting. At the same time, though, he does not repeat his delivery well, as he has a tendency to raise or lower his arm slot, which can completely mitigate the deception in his delivery. He hides the ball for a long time, but the arm slot can telegraph when a breaking ball is coming. And that may be the reason why the command of all but his fastball is subpar at best. Perez is often compared to fellow Yankees farmhand Domingo Acevedo as a result of all of this, and it’s not too hard to see why. To his credit, though, Perez is more athletic than Acevedo, and a bit more polished on a comparative level. Perez should open the season at High-A Tampa, and I suspect that he’ll spend at least half of the season there (if not longer), regardless of how well he performs. Barring disaster, I suspect he’ll finish the season at Double-A Trenton. It’s difficult not to love the fastball, with its easy velocity and natural movement. And I’m a believer in his change-up when his mechanics are right. If he’s going to be a starter at the highest level, however, he will need to refine at least one of his breaking balls. Everything that I have seen and read suggests his curve is the less bad of the two, and I wouldn’t be surprised if he ended up scrapping his slider for that; or, in a broader sense, giving up one to focus on the other. Combining his fastball with a couple of average secondary offerings would be enough to make him a mid-rotation starter. Absent that, he could be a dominant reliever with a 100 MPH fastball and a show-me pitch or two. I’ll be following him closely this season, as I’m fascinated to find out what happens next. The 22-year-old Otto grew up in the Houston suburbs and attended Concordia Lutheran High School in Spring, Texas, where he had a decorated baseball career. Despite that, Otto was not a highly regarded prospect out of high school — Baseball America did not rank him among their top 500 prospects for the 2014 draft — and he went undrafted. He followed through on his commitment to Rice. Otto quickly took over as a trusted setup man during his freshman season with the Owls, throwing 41 innings with a 1.54 ERA and a 65/28 K/BB. He spent the summer with the Santa Barbara Foresters of the California Collegiate League, where he finished with a 3.80 ERA and a 58/16 K/BB in 42.2 innings, all as a starting pitcher. Baseball America ranked Otto as the sixth best prospect in the circuit. As a sophomore at Rice, Otto worked 71.2 innings, all in relief, and posted a 2.26 ERA with a 76/30 K/BB. He saved eight games and was named to the All-Conference USA and All-Regional Teams. He traveled to Cuba with the U.S. Collegiate National Team during the summer, and was part of a Team USA roster that included future first rounders Keston Hiura, Alex Faudo, and Brendan McKay. Otto was named to the Golden Spikes Award Watch List prior to his junior season — that’s basically a watch list for baseball’s Heisman Trophy — but he battled a sore shoulder during fall ball and had a down year, throwing 59.2 innings with a 3.77 ERA and an 81/29 in his final season at Rice. He made two spot starts, but otherwise worked primarily in relief. Otto finished his career with the Owls with 2.62 ERA and 222 strikeouts in 172 innings. Last spring MLB.com ranked Otto as the 96th best prospect in the 2017 draft class while Baseball America ranked him 170th. The Yankees selected Otto with their fifth round pick, the 152nd overall selection, and signed him quickly to a straight slot $320,900 bonus. The Yankees had Otto begin his pro career with a pair of rookie ball tune-up appearances before assigning him to Short Season Staten Island. With the Baby Bombers he threw 17 relief innings with a 1.59 ERA (1.37 FIP) and a 25/5 K/BB. That works out to a 37.3% strikeout rate and a 7.5% walk rate. Otto threw 2.2 scoreless innings in his lone postseason appearance with Staten Island, then headed to Instructional League after the season. Built solidly at 6-foot-4 and 225 lbs., Otto is a pure power pitcher with a mid-90s fastball he can run up to 98 mph, though when he initially came back from his shoulder issue last year, it was more 91-93 mph. His velocity was all the way back by time he reported to Staten Island. Otto’s go-to secondary pitch is a hard low-80s knucklecurve — you can see the grip in the photo at the top of the post — that drops off the table and allows him to miss a ton of bats. When he’s right, Otto goes out to the mound with two swing-and-miss pitches with his fastball and curve. His changeup is a distant third pitch and he basically never uses it, so Otto is a two-pitch guy.
? Thanks to a pretty clean delivery he repeats consistently, Otto hasn’t had problems throwing strikes in his career, even with the knucklecurve. (That pitch is notoriously difficult to locate.) There is some thought Otto can start long-term because he’s big and strong, and because he has two quality pitches to serve as the foundation of his arsenal. All he’d need to do is build up his stamina and work on his changeup. It is notable Otto had a shoulder issue early last year — he didn’t have surgery, so that’s good, and as far as I can tell it has only been described as soreness — because Rice pitchers have a long history of breaking down in pro ball. The sore shoulder could be nothing, or it could be an indication of bad things to come. The Yankees were willing to bet a fifth round pick and $320,900 on it being nothing. A few years ago the Yankees adopted a “let’s take all our best arms and make them starters” approach in the minors, and I assume that will apply to Otto next season. Give him a year in the rotation and see what happens. Maybe he’ll be the next Chance Adams! Or maybe it’ll be like Jonathan Holder’s year in the rotation, which was good statistically, but his stuff backed up so much as a starter that the Yankees decided it wasn’t worth pursuing. If the Yankees do decide to let Otto start, I imagine he’ll begin the season with Low-A Charleston. If they keep him in the bullpen, High-A Tampa is more likely. I see Otto as a fairly generic relief prospect, which doesn’t mean I don’t like him. It just means I don’t see much to separate him from the Holders of the world. Otto has the velocity, has the quality breaking ball, and has the arm injury that took a bite out of his stock. That’s usually what these guys look like, right? Getting a big league reliever with a fifth round pick would be a big win for the Yankees. Otto could develop in a legitimate late-inning guy with good health, but for now, I see him as more of an interesting key-an-eye-on guy than a bonafide top relief prospect. Nick Solak, who turned 23 just last week, was born in Woodridge, Illinois, and attended nearby Naperville North High School, where he would spend three years as the varsity shortstop. He was excellent in high school, lettering and making the All-Conference Team in all three varsity seasons and setting the school record with a .442 batting average as a junior, but he went undrafted. Solak probably didn’t view that as much of a setback, as he ended up attending college baseball powerhouse Louisville for three years. The Cardinals won the conference and regional championships in each of Solak’s three seasons there, and he played a tremendous role on those teams, slashing .346/.442/.484 with 11 HR and 36 SB in 506 at-bats, and splitting his time between second base and the outfield. He was at his best in his junior season, when he hit .376/.470/.564 with 5 HR, 9 SB (0 CS), and more walks (28) than strikeouts (22) in 47 games. The Yankees selected Solak with their second-round pick (62nd overall) on the heels of that season, in the 2016 draft. He signed shortly thereafter for $950,000, which represented some savings against the slot value of $1,040,800. Solak officially signed with the Yankees on June 21, 2016, and he made his pro debut at short season Staten Island just two days later. He went 1-for-4 with a walk and a stolen base in his first game, and that set the tone for a tremendous all-around season. Solak would go on to hit .321/.412/.421 (155 wRC+) with 3 HR, 8 SB (0 CS), a 10.8% walk rate, and 14.0% strikeout rate in 279 PA for Staten Island. He ranked in the top-four in batting average, on-base percentage, and wRC+, as well. It’s not terribly surprising to see a player out of a major college program perform well in the New York-Penn League, but it’s nevertheless a welcome occurrence. For this, he was named as a starter on Baseball America’s short season All-Star team, which includes both the NYPL and Northwest League. As expected, Solak opened 2017 at High-A Tampa. And, as hoped, it was more of the same. Solak hit .301/.397/.460 (153 wRC+) with 10 HR, 13 SB (4 CS), a 13.1% walk rate, and a 18.7% strikeout rate in 100 games for Tampa; and those numbers are sold a bit short by the pitcher-friendly nature of Tampa, as well as the Florida State League as a whole. He ranked in the top-five in the league in all three slash stats, in addition to BB%, BB/K, and wRC+, and earned a promotion to Double-A on August 1. Solak was not among the class of the league for the first time in his career following the promotion, though his overall numbers were still strong. He hit .286/.344/.429 (112 wRC+) with 2 HR and a steal in 30 games for Trenton, showing signs of wear and tear as his time at the level went on. Solak went just 7-for-34 in September, including the Double-A playoffs, and was more aggressive than usual. Whether it was a matter of more advanced pitchers adapting to him or the longest season of his career taking its toll is a question that bears pondering heading int0 the 2018 season. Solak checks in at around 5’11” and 175 pounds, and is therefore automatically considered gritty and/or a gamer. To be fair, though, that’s not all that far from the truth, based on the reports out there, as well as the fact that he has a propensity for beating out infield singles. Though, that may also be due to the fact that his two best tools are his plus hit tool and above-average to plus speed – and those will need to carry him to the show.
? Solak’s ability to barrel the ball has never been in question, dating back to his time in Louisville. He has a quick bat and smooth mechanics, and he is capable of driving the ball to all fields. He works the count, as well, and has earned a reputation for working himself into hitter’s counts and either taking the walk, or getting his pitch to hit. And, despite his modest build, Solak has average-ish pop, and could hit 12 to 15 home runs at the highest level. It’s not just pull power, either, as six of his twelve home runs last year went out between center and right field. He’s also a very good base-runner, in terms of both stealing and taking he extra base. While nobody considers Solak a burner, his combination of headiness and above-average speed makes him an asset on the basepaths. He boasts an 81.5% success rate in 27 professional steal attempts, for what it’s worth. With that out of the way, it’s time to talk about his position. Solak is, at best, a fringe average defender at second. He has fringe average range and just enough arm for the keystone, and that’s far from a ringing endorsement. As a result of this, the inevitable comparison for Solak, in the minds of many, is Rob Refsnyder. However, Solak’s defense is already stronger than Refsnyder’s, his bat is quicker, and he’s a much better athlete. That may be damning with faint praise – but it’s something. Solak will probably open 2018 back at Double-A, if only because of the numbers game. Gleyber Torres, Thairo Estrada, and Tyler Wade could all conceivably start the season at Triple-A, and all three are on the 40-man roster. It seems inevitable nonetheless that Solak will move up to Scranton/Wilkes-Barre at some point this year, with an outside chance of spending some time in the Bronx. Given the Yankees handling of Miguel Andujar, who is similarly gifted offensively and iffy defensively, that’s not a guarantee. Were he in any other organization, I may well see Solak as the second baseman of the future. His defense has improved noticeably as a professional, and I think that he can be average at the keystone in time. I don’t see Solak as being an asset defensively, which puts a great deal of pressure on his bat – but his bat speed, ability to use all fields, surprising power, and all-fields approach make me confident that his offense will be potent enough to keep him on a major league roster. And it’ll have to, because he doesn’t have the defensive tools to be a utility player. Estevan Florial signed out of the Dominican Republic for $200,000 back in March of 2015, though his story begins well beforehand. The son of a Haitian mother and an unknown father, Florial — then known as Haniel d’Oleo — utilized falsified documentation to enroll in school in the D.R., which he otherwise would have been unable to do due to his lack citizenship. Unfortunately, this mostly innocuous ruse (which did not alter his age) was discovered by the Commissioner’s Office, so he was suspended for a year beginning in 2014, and was therefore ineligible to sign as a 16-year-old. The prospect formerly known as d’Oleo was viewed in a similar light as players that received bonuses of $2 MM and up, and ended up receiving just one-tenth of that. Florial made his professional debut about three months after signing, debuting in the Dominican Summer League on June 9, 2015. He went 1-for-3 with 2 RBI, a walk, a strikeout, and a steal in that game, and that set the tone for the rest of the season (if not the rest of his career to-date). Florial spent the rest of the year in the DSL, slashing .313/.394/.527 with 7 HR, 15 SB (5 CS), an 11.3% walk rate, and a 22.9% strikeout rate in 266 PA. It was an excellent all-around showing, and his 154 wRC+ ranked 12th in the league. Numbers at that level are oftentimes taken with a grain of salt, but the buzz around Florial nevertheless began in earnest by the time the season came to a close. His stateside debut came at High-A Tampa on June 10, 2016, which was an incredibly ambitious move for an 18-year-old prospect. It was no surprise when he was sent down to Rookie-Level Pulaski a couple of weeks later, and he would spend most of the season at that level. Florial was inconsistent and occasionally overmatched at Pulaski, where he hit .225/.314/.364 (92 wRC+) with 7 HR and 10 SB (2 CS) in 268 PA. His walk rate dipped to a still strong 10.4%, but his strikeouts skyrocketed to 29.1%, the fifth-worst mark in the league. Florial ended 2016 on a high note, however. He was promoted to Low-A Charleston on September 1 for their stretch run, and he suited-up for five games, batting .300/.348/.550 with 4 runs, a home run, and 5 RBI in 23 PA. While it wasn’t quite enough to wash away the reality check that was his time in Pulaski, it served as a reminder of his precocious talent. Florial opened last season back at Charleston, and he proceeded to rake for four months. He hit .297/.373/.483 (146 wRC+) with 11 HR and 17 SB (7 CS) in 389 PA there, and avoided any prolonged slumps. Florial placed in the top-four in all three slash stats and ranked second in wRC+, and earned a promotion to High-A on August 1. And he just kept hitting, posting a .303/.368/.461 (141 wRC+) slash line in 87 PA. He also chipped in a couple of home runs and 6 steals in 7 chances, and lowered his strikeout rate by 4.3 percentage points … albeit to a still high 27.6%. As a result of this, Florial placed 71st on Baseball America‘s midseason top-hundred – and most expect him to rank higher on most lists heading into 2018. Florial’s season didn’t end there, though. He made the Double-A Trenton playoff roster, and saw action in two games. He went 1-for-4 with 3 strikeouts in his lone start (though he did throw out a runner at home), and pinch ran in another game. He then continued onto the Arizona Fall League, where he hit .286/.383/.414 in 81 PA. Florial struck out 29 times in those 81 PA, but he otherwise drew rave reviews for his performance (particularly on defense). The term “five tool prospect” is thrown around far too liberally nowadays (if not in perpetuity), and that is always worth mentioning with a prospect like Florial. He checks in at an incredibly athletic 6’1″ and 185 pounds, and it’s fairly easy to throw above-average or better grades on his power from the left side (especially his raw power), speed, glove, and arm. Some reports will throw plus or better grades on all four of those tools, with his speed grading as plus-plus. In short, there’s a heck of a lot to like. Florial’s speed, instincts (advanced for his age), and arm stand out in games, and he profiles as an above-average big league centerfielder – perhaps even better if he doesn’t put on much more weight. And, even if he gets a bit bigger, there’s no reason to think that he couldn’t be an elite defender in either corner. It doesn’t show up in the box score all that often, but his overall defensive profile is a legitimate carrying trait. Offense is, of course, what gets everyone excited, and Florial has standout potential with the bat. His raw power is frequently lauded as plus or better, and that doesn’t come through in the numbers (yet). What it all comes down to, though, is his hit tool. Most every report lists his hit tool as average to above-average, and it’s not difficult to see why, given his high batting averages. However, the career 28.8% strikeout rate speaks for itself to some extent, and he is incredibly aggressive at the plate. He is capable of discerning balls from strikes, as evidenced from his strong walk rates – but he is still learning how to identify what strikes to swing at, and his two-strike approach is very much a work in progress. Here’s the thing, though – he’s 20. The flaws are real, but he spent all of the 2017 season as a teenager, and he’ll spend all of the 2018 season as a 20-year-old. And his tools are nothing short of excellent. There are rumblings that the Yankees will have Florial start the season at Trenton, which would be reasonably aggressive. He looked terrific at Low-A and in a small sample at High-A, and he’s an elite prospect. I wouldn’t be shocked if he opened the year back at High-A, though. And there’s an outside chance that we see him in the majors this season, if only as a benchwarmer once the rosters expand. It’s worth noting that he’ll have to be added to the 40-man roster after the season, as well. I have Florial as the Yankees second-best prospect, and he’s almost as close to untouchable as Gleyber Torres. No prospect is truly untouchable, to be sure – but I’m enamored by Florial’s power, speed, and defense combination, as well as the frequent comparisons to Curtis Granderson. I don’t love comparisons, but this one makes sense on a purely statistical expectation level, and it gives you an idea as to how valuable Florial could be. His strikeout rates certainly bears watching, but that’s okay as he’s the most must-watch prospect in the Yankees system. The 23-year-old Chance Adams was born and raised in Scottsdale, AZ, where he attended Chaparral High School, winning back-to-back state championships in his final two seasons. That small school, whose graduating classes are generally around 300 students, also produced Brian Bannister, Ike Davis, and Paul Konerko (as well as Brie and Nikki Bella, but I digress). Adams spent two years at Yavapai College, a junior college, before transferring to Dallas Baptist University for his junior year in 2015. He was excellent there, posting a 1.98 ERA and striking out 83 (against just 13 walks) in 59 IP – though, he did so pitching exclusively out of the bullpen in a set-up role. While it would be inaccurate to say that there was no hype for Adams heading into the 2015 draft, his name was not well-known to most. Baseball America had him ranked as the 245th best prospect in the class, and that represented the high water mark for his pre-draft stock. The Yankees saw something they liked, though, and snagged him with their fifth round pick, 153rd overall. Adams signed to a below-slot $330,000 bonus shortly thereafter. 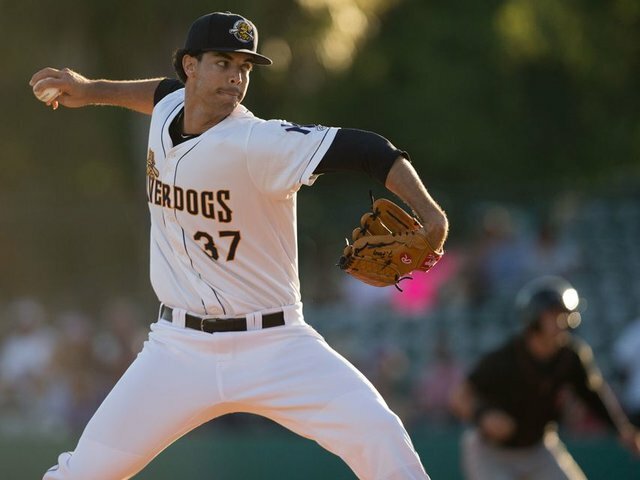 Adams made his professional debut less than two weeks after being drafted, and he pitched at three levels – Short Season Staten Island, Low-A Charleston, and High-A Tampa – before season’s end. He continued to work out of the bullpen, and his numbers weren’t too dissimilar from his production at Dallas Baptist; in 35.1 IP, 24 H, 9 BB, 45 K, 1.78 ERA. Rumblings that the Yankees would convert Adams to a starter for the 2016 season began in earnest before the season was over, and it was confirmed by the team before the end of the calendar year. With a new course charted, Adams made his first professional start at Tampa on April 9, 2016; it didn’t go too well, as he allowed 6 hits (including 2 home runs) and 6 runs (5 earned) in just 3.1 IP. He struggled mightily in three of his first five starts, but he righted the ship when the calendar turned to May, and he was utterly dominant from that point forward. Over his last 20 games (19 starts), Adams pitched to the following line – 107.2 IP, 56 H, 31 BB, 119 K, 1.67 ERA, 45% GB. And that included a mid-season promotion to Double-A, where he ranked among the top-three in ERA, K%, and K-BB% among pitchers who started at least 10 games. Despite his excellent season, Adams didn’t get much love on prospect lists heading into 2017. He didn’t make the top-100s of Baseball America, Baseball Prospectus, Keith Law, or MLB.com, which are oftentimes the go-to lists for baseball writers and fans. He did, however, have a fan in John Sickels of Minor League Ball, who ranked him as the 78th best prospect. And Adams made him look like something of a genius. Adams opened 2017 back at Trenton, making six dominant starts (35.0 IP, 1.03 ERA) before earning his promotion to Triple-A Scranton/Wilkes-Barre for a May 14 start. He proved to be right at home in the highest level of the minors, with two scoreless outings in his first four times out, including a what may be his most dominant performance to-date – 6 innings of one-hit, no run ball, with 12 strikeouts and 2 walks against the Columbus Clippers. All told, Adams made 21 starts at Triple-A, tossing 115.1 IP of 2.89 ERA ball, with a 22.3% strikeout rate and 9.3% walk rate. Adams is short for a pitcher, checking in at right around 6′ tall, and he’s a solidly-built 215ish pounds. He works quickly on the mound, drawing praise for both his smooth, compact delivery and the natural deception in his mechanics. And – TINSTAAPP be damned – many believe that those clean mechanics have played a huge role in his ability to stay healthy. Stuff-wise, Adams has two pitches that grade out as plus: his mid-90s fastball with “rising” action, and a diving, mid-80s slider. Those are the two pitches that helped him dominate as a reliever in college, and they’ve only improved as he has worked with professional coaches. He also features a couple of fringe-average to average offerings in his mid-80s change-up and a curveball in the upper-70s. The curveball is probably the better of the two right now, if only because he repeats his delivery so well, and it has a similar shape to his slider with much less velocity.
? Adams is one of those pitchers that falls prey to the “control versus command” argument, as he has plenty of the former, but sometimes lacks the latter. The 2017 season was the first time that Adams struggled a bit with the free pass, though, and his walk rate has been trending up each year; that goes hand in hand with a slip in strikeouts, as well. That is not unexpected, given that each year represents a move up the organizational ladder, and his walks did drop back down at Triple-A – but it’s something to keep an eye on nonetheless. It feels almost inevitable that Adams is going to serve as trade bait for the Yankees. He is just about as ready as a prospect can be for the show, but the big league team already has a full rotation, and they’ve been consistently linked to young, controllable pitchers. 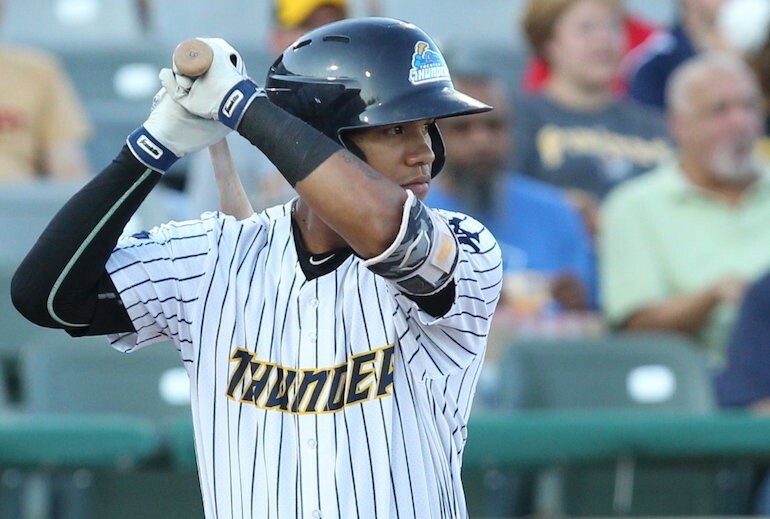 Joel Sherman reported that the Yankees don’t want to deal Gleyber Torres, Estevan Florial, or Justus Sheffield in such a deal, which leaves Adams and Clint Frazier as the most attractive young pieces in the organization. Should the Yankees stay the course, Adams will probably be the team’s sixth starter – and that could be a substantial role. Eight different pitchers made at least five starts for the team last year, and he could be first in line for that overflow. Moreover, Luis Severino and Jordan Montgomery both set career-highs in innings pitched last year, and their workloads are sure to be monitored as a result. Adams has more than earned a shot at the majors, and I am confident that he has all of the makings of solid starting pitcher. He has stayed healthy and productive under increasing workloads, and he has stuff that belies his size. I do think that he is more likely to be a fourth starter than his statistical profile suggests, given his size and modest groundball rates, but there’s a ton of value in that – especially when the player is under team control for six years.